Quincy Compressor, a manufacturer of high-quality industrial air compressors, uses several advanced web tools to connect potential customers to their sales force. On one hand, Quincy uses Bullseye web locator to help visitors find their sales representative. Because Quincy’s sales organization is based on territories, Bullseye’s versatile territory feature gives Quincy a degree of control not possible with a proximity-based locator. Quincy also uses a third-party document management system to allow web visitors to download product literature. Further, Quincy purchases qualified leads from a third-party lead generation website. While these three features offered value to Quincy Compressor’s potential customers, Quincy saw an opportunity to transform these services into a highly productive lead funnel with greater control and automation. In particular, while Bullseye accurately directed prospects to distributors, the transactions were not captured, so Quincy could not track and follow up on them. Even more importantly, highly qualified leads generated through literature requests and the lead gen site were languishing, largely because the manual process of distributing these leads to territory reps was laborious and slow. Consequently, most of these leads were stale by the time front-line sales could respond to them. And, Quincy still had no way to track the disposition of these leads and ensure follow-through. Quincy Compressor enlisted the services of the Bullseye Locations team to mine this rich vein of potential customers by implementing the Bullseye Lead Management Software add-on to the web locator with custom integration through to the document management system. 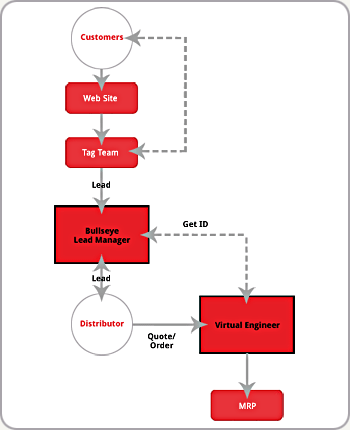 The Bullseye lead management path includes automatic routing of leads based on the existing territory structure in the web locator, as well as automated thank-you confirmation email to the customer, lead notification email to the assigned distributor, and timed reminders for leads not properly responded-to or actions not reported. And, the entire process is transparent to Quincy’s corporate marketing staff, who can see leads, track distributors’ follow-through, and intervene to keep the sales cycle moving smoothly. Custom integration with Quincy’s document management system includes a double opt-in process that requires customers to click a link in an email to verify their request for literature. On verification, in addition to receiving their literature, the lead is immediately queued in the Bullseye system for distribution and follow-up. Quincy has integrated a quoting system which by standardizing across all dealers allows them to quickly and efficiently generate customer quotes for leads that come through the system. The last piece of the puzzle is an integration with a third-party lead generation website. This integration provides a steady stream of outside referrals that flow through the entire sales funnel. Quincy’s Bullseye Lead Management system was launched in August of 2007. In the first 2 years alone, an estimate of $2M in sales were attributed directly to Bullseye. Today, Quincy continues to use Bullseye Lead Management and the associated integrations as an effective tool for qualifying and distributing leads quickly to their dealer networks.